Wing span: 3 5/8 - 6 1/2 inches (9.2 - 16.5 cm). Identification: Male is yellow with dark tiger stripes. 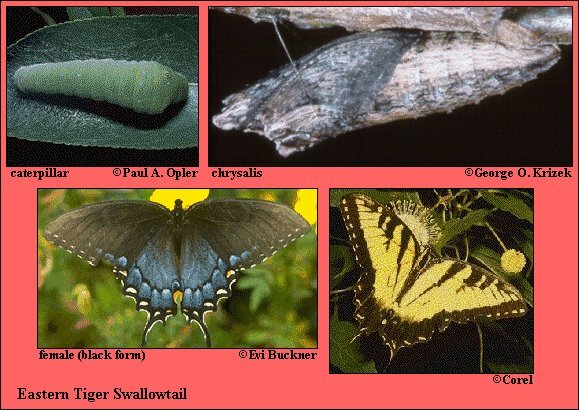 Female has 2 forms: one yellow like the male and the other black with shadows of dark stripes. Hindwing of both female forms has many iridescent blue scales and an orange marginal spot. On the underside of forewing of both female forms the row of marginal spots has merged into a continuous band. Life history: Males patrol for receptive females. Females lay eggs singly on host leaves. Caterpillars eat leaves and rest on silken mats in shelters of curled leaves. Chrysalids overwinter. Flight: 3 flights from February-November in Deep South; 2 flights from May-September in north. Caterpillar hosts: Leaves of various plants including wild cherry (Prunus), sweetbay (Magnolia), basswood (Tilia), tulip tree (Liriodendron), birch (Betula), ash (Fraxinus), cottonwood (Populus), mountain ash (Sorbus), and willow (Salix). Adult food: Nectar of flowers from a variety of plants including wild cherry and lilac (Syringa vulgaris). Habitat: Deciduous broadleaf woods, forest edges, river valleys, parks, and suburbs. Range: Eastern North America from Ontario south to Gulf coast, west to Colorado plains and central Texas.